Simon Morris writes: Extreme Reading was made through conversation, on the telephone. The artist Pavel Büchler and I had a 59 minute conversation about Kenneth Goldsmith's book Soliloquy which was also constructed through conversation. Goldsmith recorded every word he spoke for an entire week (April 15 to 21 1996) - 183,685 words. Both Büchler and I recorded our conversation in Manchester and York respectively. I then transcribed both halves of the conversation. 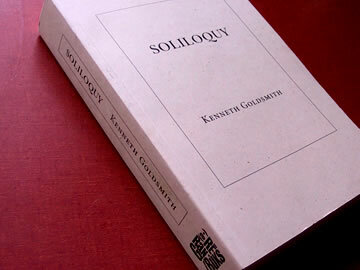 They were intended as bookends to Goldsmith's work 'Soliloquy' with one half of the dialogue at the front of the book and one half at the back, so that it was impossible for the reader to see both sides of the conversation at once. Like walking into a room with someone on the telephone, only one half of the conversation is ever audible but the listener can always imagine what the other person might be saying. As with Goldsmith's work in which the voice of the Other has been erased, by leaving a gap, a space left by the missing dialogue, it leaves a space for the reader to resonate within the text - the reader can locate themselves within the dialogue: extreme reading.